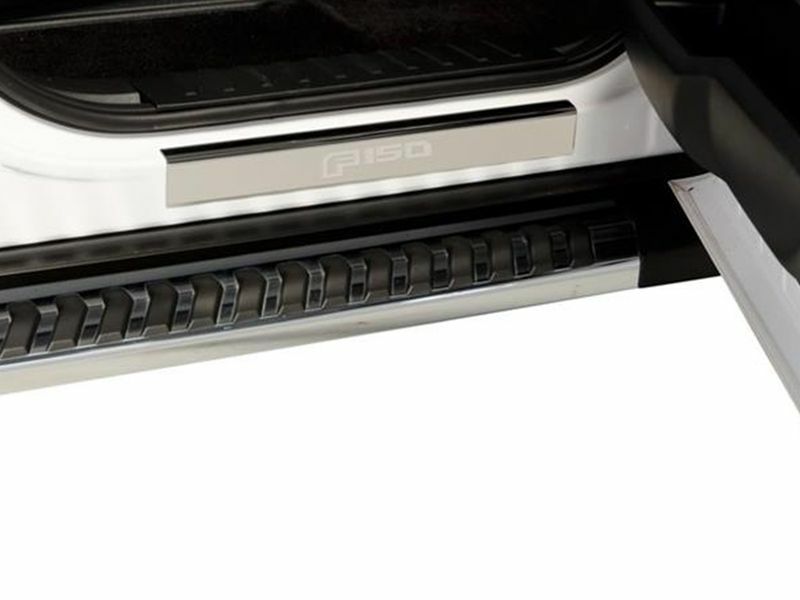 Protect your door sills from dents, scrapes, and scratches with the attractive Putco Ford licensed stainless steel door sill plates. You know you have seen plenty of vehicles that have those ugly scuffs and scratches on their door sills that look terrible. Don't let your vehicle fall victim to neglect. Protect it and keep it looking great. These Putco sill plates are polished stainless steel that will give your vehicle the wow factor. There is no doubt your passengers are going to notice these when they hop in your Ford. Not only do they look good but they even have the Ford logo etched into them. The Putco Ford licensed stainless steel door dill plates are constructed from quality stainless steel and are simple to install. Don't worry about bringing them to a shop for installation. Simply place and stick using the 3M adhesive tape that is applied to the back. Putco Ford stainless steel door sill plates are backed by a limited lifetime warranty. Install the Putco Ford licensed stainless steel door sill plates by following the installation instructions. For questions give us a call at 877-216-5446.